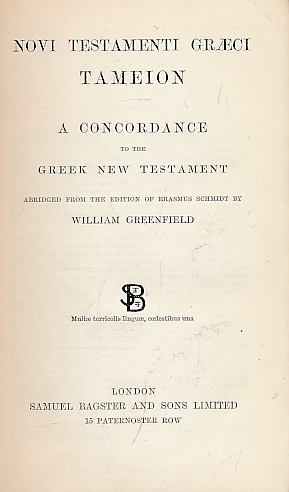 Barter Books : Greenfield, William : Novi Testamenti Graeci Tameion .. a Concordance to the Greek New Testament. London. : Samuel Bagster & Sons Ltd.
180 x 120 mm (7 x 5 inches) - vii, 280pp. Spine sunned. In G condition without dust jacket. Previous owner's inscription on ffep. ABRIDGED from the edition of Erasmus Schmidt.